As soon as the holiday season arrives, you know what that means… LOTS of PIE! I know I’m not the only one who would say this is their favorite type of dessert, without any hesitation. 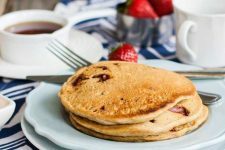 And part of the beauty of this delectable category of sweet treats is that there are so many different variations and wonderful recipes available. It wasn’t easy, but we’ve selected 23 of our favorites to share with you. 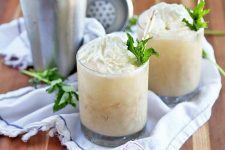 Some are tried and true classics passed down through generations, and others feature more unusual ingredients, or a spin on an old favorite. 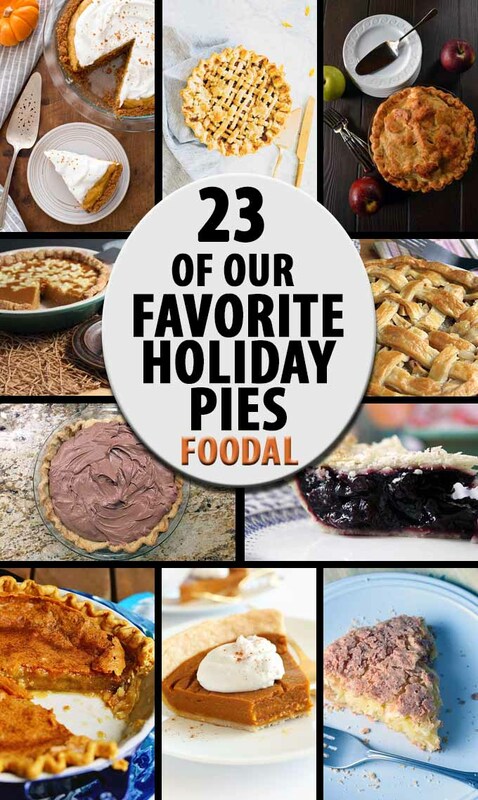 You’ll find seasonal fruit fillings, custards, chocolate, and nuts, plus vegan and gluten-free versions… a true sampling of the holiday pie genre! Which ones will you choose to bake for family and friends this year? 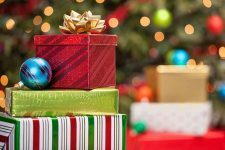 Once you’ve started perusing our round-up below, you may find that you’re not able to stop at just one or two! This recipe from Kendall Vanderslice takes the usual orange squash filling to the next level, with savory fresh sage and rich brown butter. A sophisticated take on a classic with a buttery pate brisee crust, don’t be surprised if your guests call to ask for the recipe – or if you’re still thinking about it long after the big meal is over! 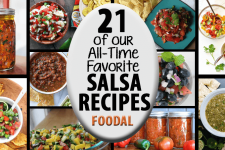 We share the recipe on Foodal. Chiffon pies have a light, airy filling that with an ethereal, mousse-like quality. And this one is no exception. 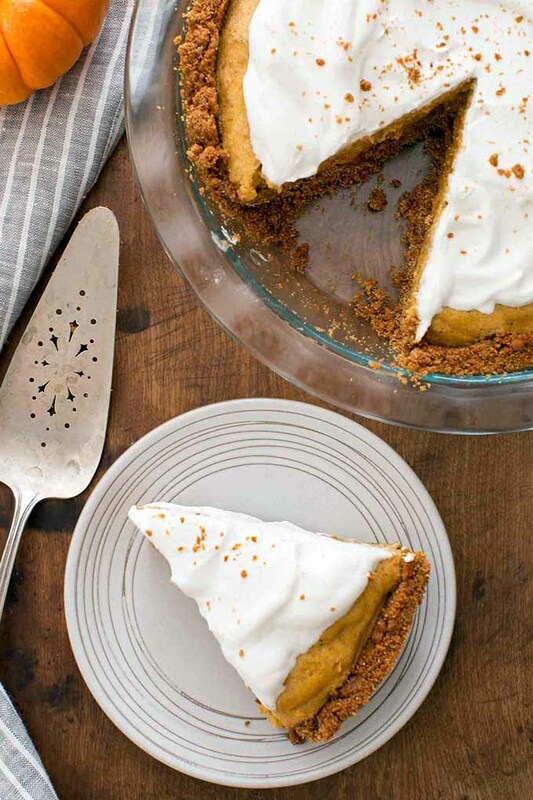 With fresh meringue folded into pumpkin filling, it’s served with a topping of whipped cream. 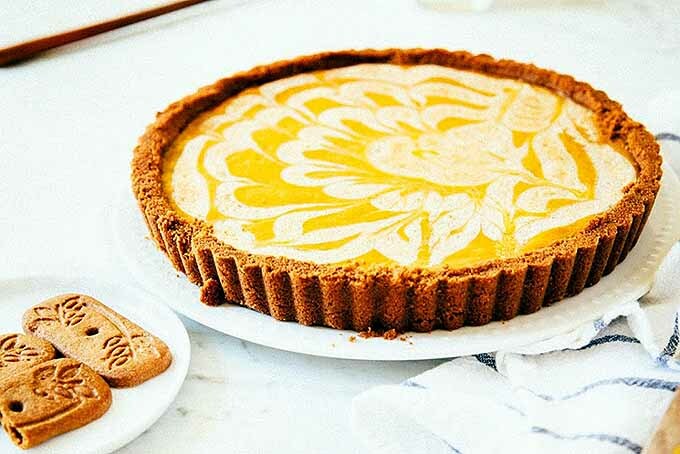 But that’s not all – this version from Elise Bauer is also spiked with a splash of rum, and it’s baked in a tasty gingersnap crust. Yum! 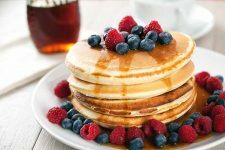 Visit Simply Recipes to learn how to make it. It can be difficult to find a dessert that everyone can enjoy at the holidays. Take my family, for example – Mom has celiac so she’s on a gluten-free diet, she and my brother are both lactose intolerant, and my aunt is vegan. But that doesn’t mean dessert is off limits! 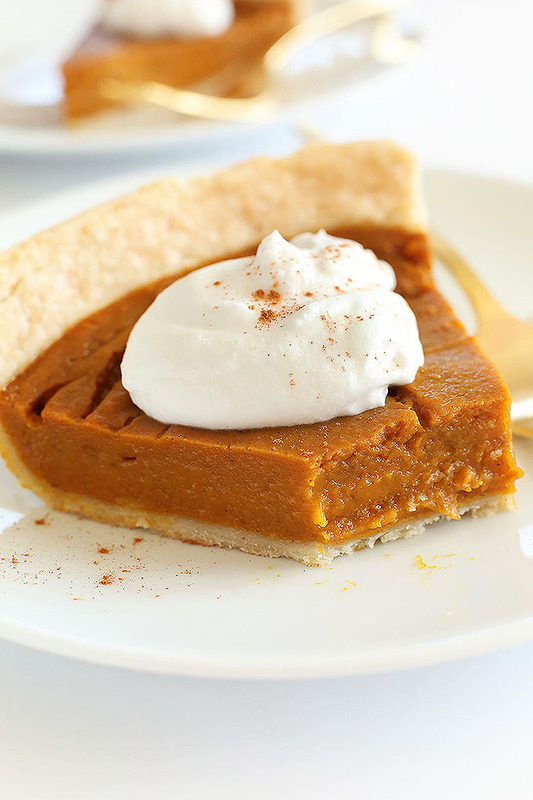 This vegan and gluten-free pumpkin pie from Dana Shultz is an excellent option that loved ones with many different food allergies and intolerances will be able to enjoy. The crust is made with vegan butter or coconut oil, and a gluten-free flour blend. And the creamy, delicious filling combines almond milk and arrowroot powder with the pumpkin puree and warming spices. At my house, I usually like to save a special treat like this one for those with special dietary needs to get their fill. But butter lovers, milk drinkers, and egg eaters will be just as happy with this dessert as they would with the alternative. Minimalist Baker shares the recipe. If you haven’t heard of speculoos (where have you been?) 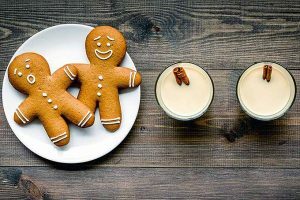 it’s a spiced Dutch biscuit that’s popular around the holidays throughout Europe. 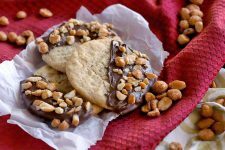 And its fame has recently spread to the US as well, with Trader Joe’s taking the lead as purveyor of products that feature this popular cookie. There you’ll find biscuits, speculoos butter to spread on toast, and even chocolates filled with the stuff. 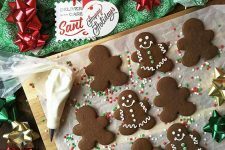 Rather than gingersnaps, Michelle Lopez uses these cinnamony cookies to make her crust. And in place of cream, she uses a pastry bag or bamboo skewer to make a marbled effect in the filling, with a pretty swirl of creme fraiche. Visit Hummingbird High for the recipe. It’s easy to roast your own butternut squash at home, and by turning that roasted vegetable into a puree, you’re more than halfway to making an excellent pie filling. This squash version from Alexandra Stafford features butternut, but feel free to experiment with whatever variety of winter squash strikes your fancy (or whatever you have on hand)! You’ll find the recipe on Alexandra’s Kitchen. 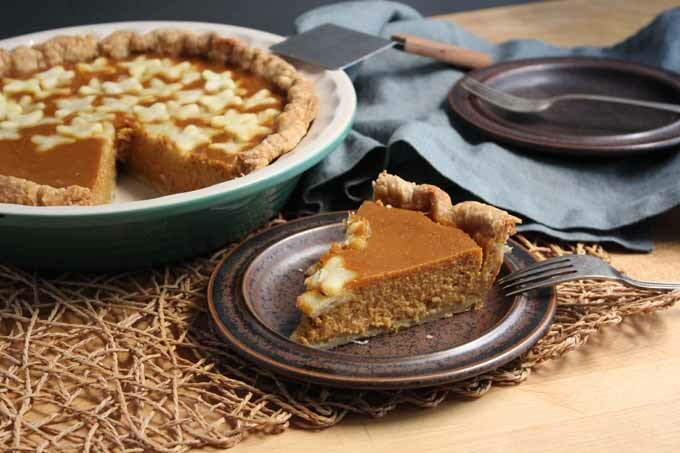 Sweet potato is a classic American pie filling, especially in the south. But this version comes all the way to us from Felicia Lim, a Singapore native who is currently residing in Argentina. Where she lives, the typical orange-fleshed sweet potatoes that are found in grocery stores in the US aren’t available. So she bakes hers with a pink-skinned white variety instead. This results in a beautiful golden, almost caramel-colored filling. And it’s perfect topped with a dollop of whipped cream. 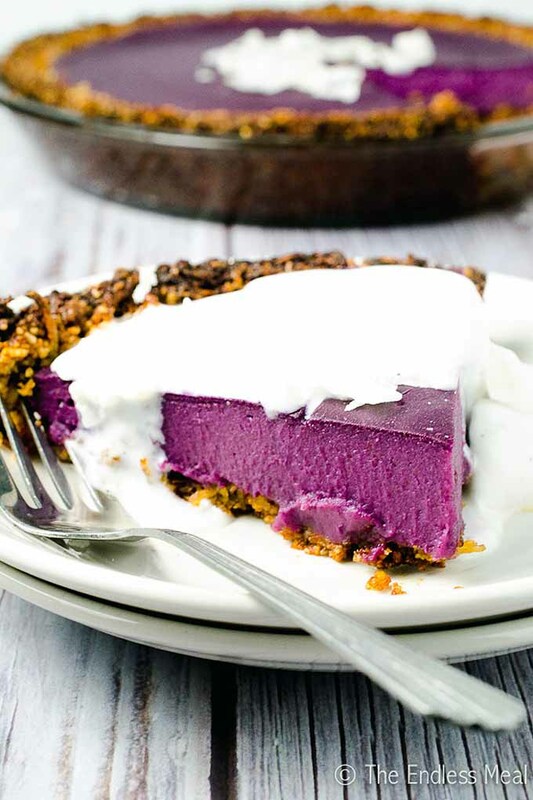 With its vibrant purple hue, this sweet treat from Kristen Stevens is an absolute showstopper. And it’s vegan, too! With a coconut almond crust and topped with coconut whipped cream, even those with dietary restrictions will be happy with a slice of this. Plus, a touch of cayenne pepper and lime juice in the filling combines so deliciously with the flavorful (and super seasonal) traditional warming spices. Check out the recipe on The Endless Meal. 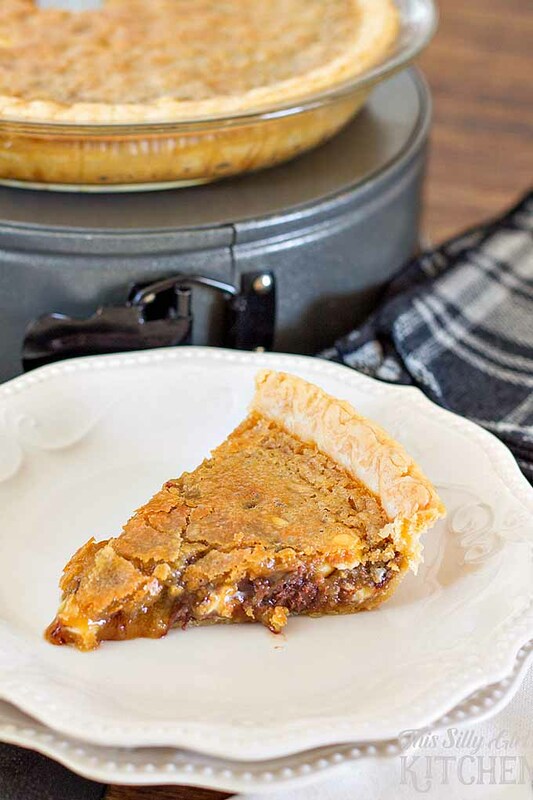 Sally McKenney Quinn tested a lot of pecan pie recipes before settling on this one as her favorite. 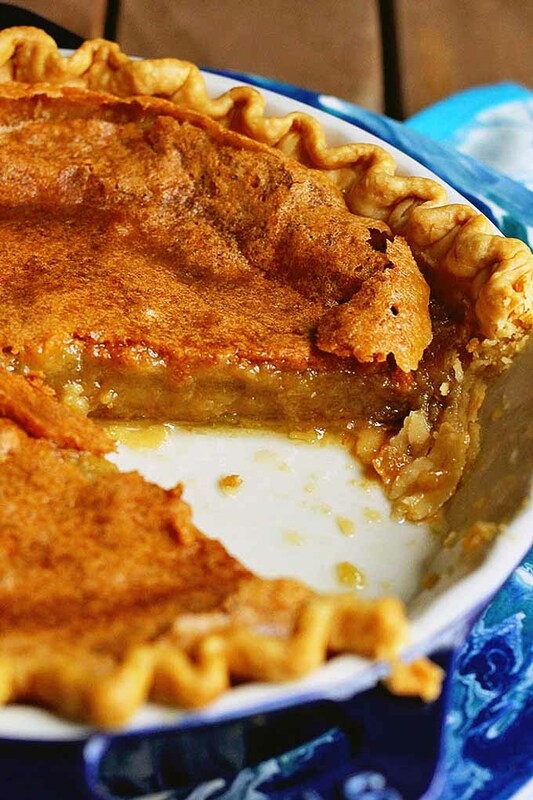 Sally shares her grandmother’s recipe, made simply with a touch of cinnamon and vanilla. With dark brown sugar and dark corn syrup in the filling, it has a deep flavor that your holiday guests will rave about. You’ll find the recipe on Sally’s Baking Addiction. If you’re going to be baking just one pie, it can be tough to choose a single flavor from so many traditional holiday options. So why not put two of your favorites together in one delicious dessert? 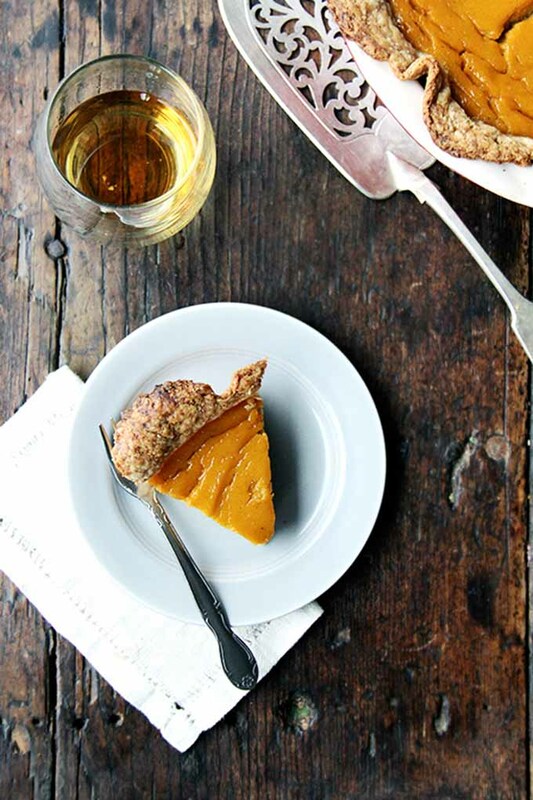 This wonderful mashup from Tieghan Gerard has a classic pumpkin layer, topped with pecans that are flavored with bourbon and sweetened with maple syrup, with a little salt to create a delightful contrast to top it all off. 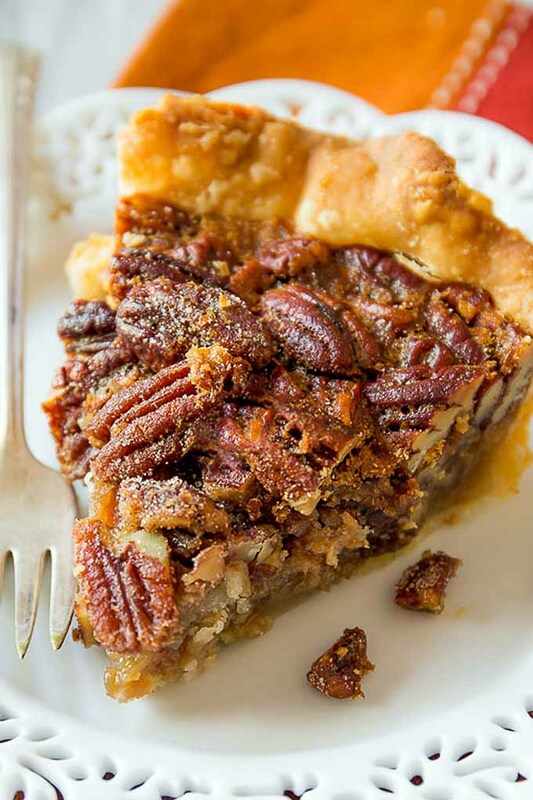 Pecan is what they’ll see on the sideboard – but the fam is in for a surprise when it’s slicing time! Check out the recipe on Half Baked Harvest. 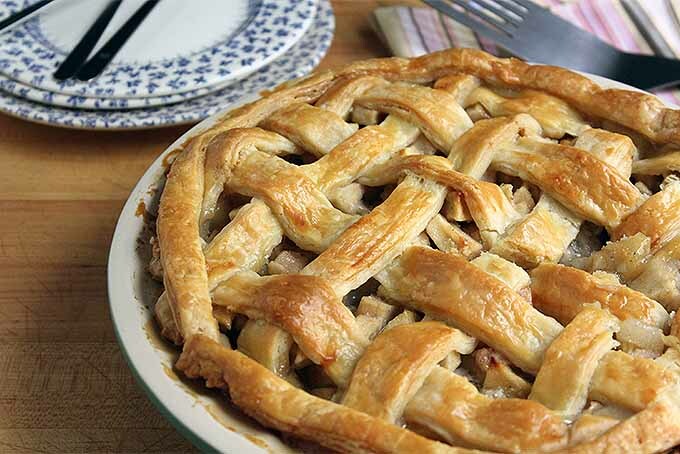 Caramel apple pie is one of my personal favorites, and it’s a cool-weather flavor combo that I love in every iteration. 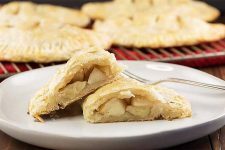 Whether crisp Granny Smiths are dipped into homemade caramel (or even melted store-bought candy), chopped apples are baked into a sweet scone dough with caramel drizzled on top, or tart apples are baked into a pie filling with ooey-gooey candy, this pairing is sure to be a hit. Aysegul Sanford makes hers with a touch of cinnamon and nutmeg, and a sprinkling of brown sugar on top. The recipe is available on Foolproof Living. 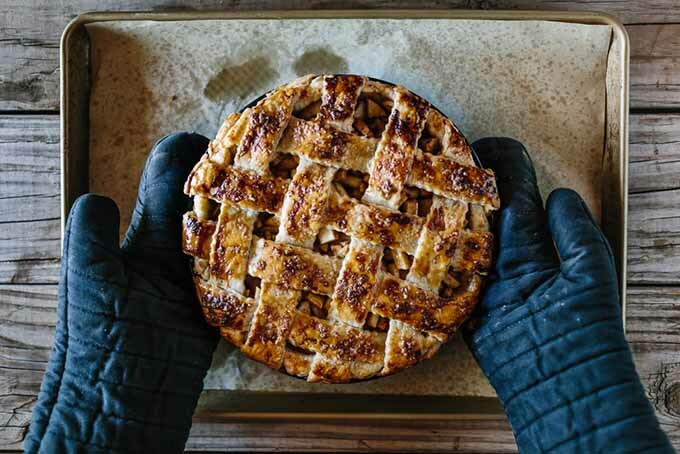 I think the first time that I ever had cheddar cheese with an apple pie was when we cracked open a sharp waxed block from Vermont that friends of my grandparents brought back from their travels. And that first taste of salty, umami-rich cheese paired with the juicy, sweet, and tart apples will always stay with me. So, I’m definitely partial to this particular combination. But I’m betting a lot of you love it as well. And if by some weird quirk of fate you’ve never had the opportunity to try it, now’s your chance! Nikki Greer’s recipe actually blends shredded cheese into the top crust, for added deliciousness. And with tips for making this treat ahead of time and freezing it until the holiday, you don’t want to miss this. 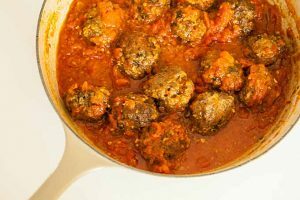 Check out the recipe now on Minced. We’re often so focused on the many varieties of apples that are available at this time of year that we forget another equally delicious fall fruit – the pear. 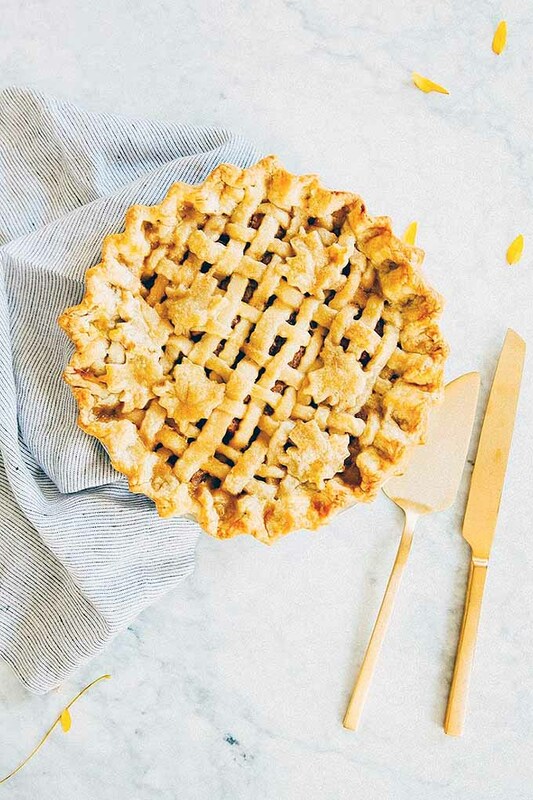 A combination of apples and pears is delicious, like you’ll find in Kendall’s pie below, but pears can certainly stand alone as the main ingredient. 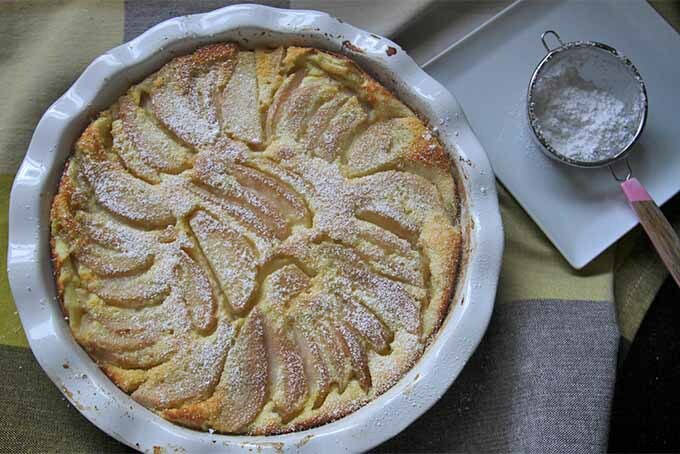 This custard version from Tracy Benjamin arranges sliced Comice or Bartlett pears beautifully around the bottom of a buttered baking dish, with vanilla or almond custard poured on top. A shower of powdered sugar provides the perfect garnish after you take it out of the oven. As an added bonus, this one is crustless and the filling is gluten free. 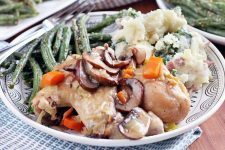 Get the recipe now on Shutterbean. Not only does this juicy offering from Kendall Vanderslice combine two of fall’s most perfect fruits, it also reaches a little further back into the spice rack to pull out a few spices that often live in the shadow of cinnamon and nutmeg at this time of year. 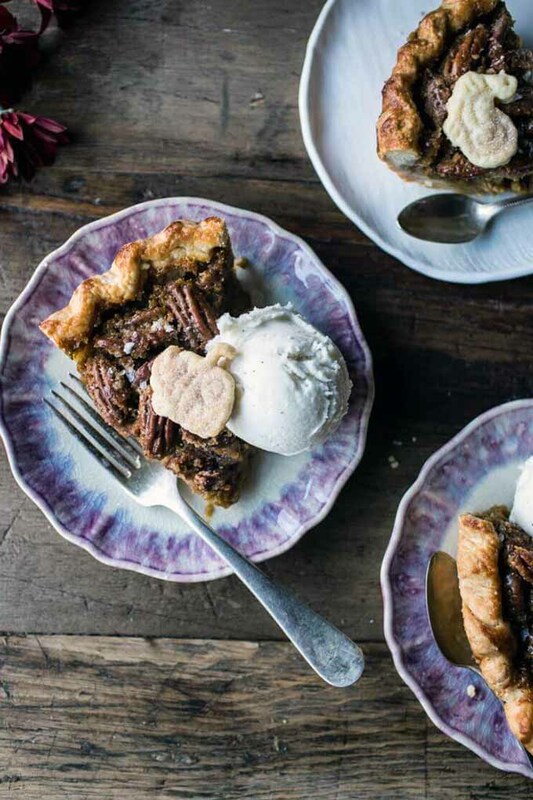 Flavored with cardamom and ginger, with arrowroot starch added to help thicken up the filling, you’ve love the unique flavor shift that this pie offers. 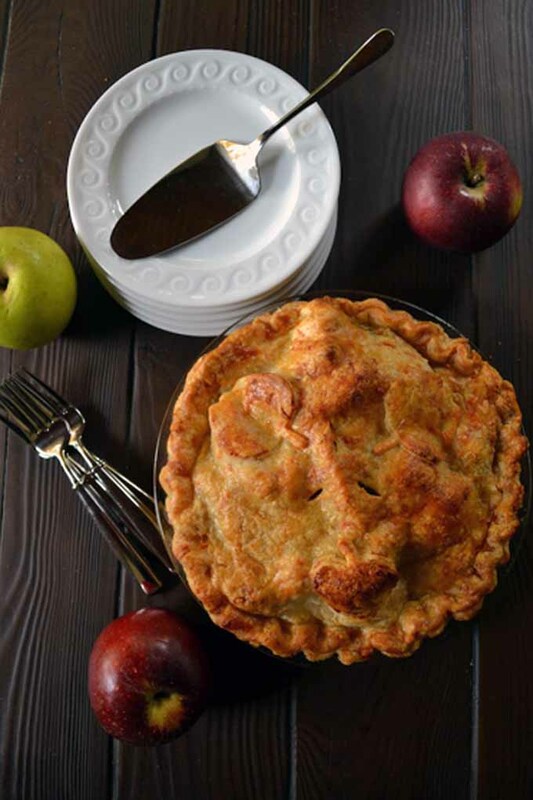 It’s just enough of a chance that your classic “apple pie or nothing for me” relatives will still be happy – and hopefully pleasantly surprised! 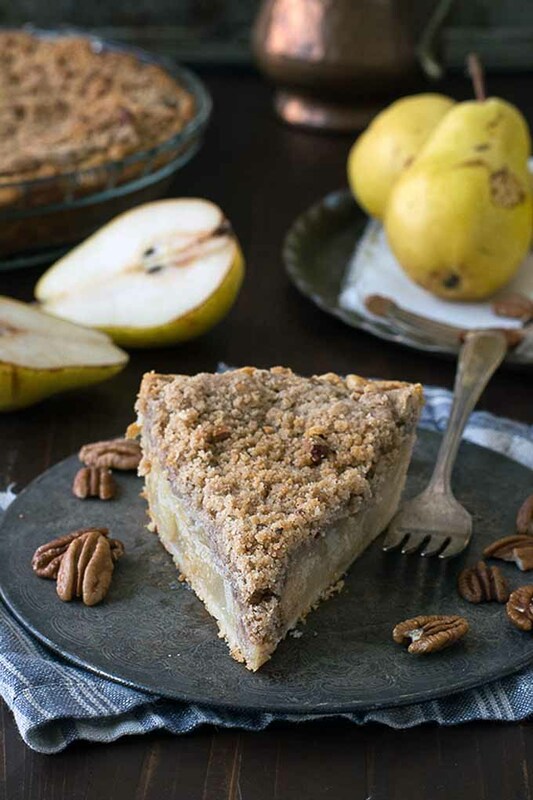 Another delicious pear-focused option, this one from Michelle Lopez is sweetened with maple. Plus, it’s baked in a tender cream cheese crust that’s just a little bit tangy – the perfect complement to the juicy sweetness of the fruit. You’ll find the recipe on Hummingbird High. At least one streusel-topped pie absolutely had to be included on this list, and you’re going to go nuts for this one. The combination of pecans, cinnamon, brown sugar, and butter in Beth Baumgartner’s topping is sweet and rich, and it goes so well with the juicy pear filling. Find the recipe now on The First Year. 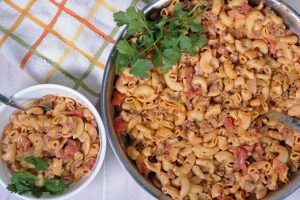 For some of you out there, this one will hit on that nostalgia factor to the max, with a topping and filling that’s reminiscent of Grandma’s kitchen, or fall afternoons long ago. For others, it will bring something entirely new to the table. Quince is a pectin-rich seasonal fruit that’s perfect for making into jam – or filling a pie. 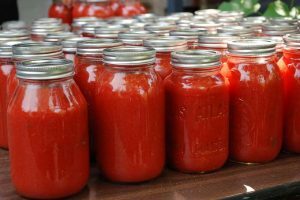 Too astringent to eat raw on its own (though I once saw a fellow classmate try when I was in college – this was done on a dare, when a bush laden with ripe, yellow fruit outside our dorm just looked too good to pass up…) it’s great for cooking. Apples, pears, and quince are all part of the rose family (Rosaceae), with fleshy fruit (called pomes) and seeds in the center. If you’ve never tried quince, it has a texture that’s a bit grittier than a pear, delicious when poached, stewed, or baked, with a tart flavor and beautiful perfumey aroma. 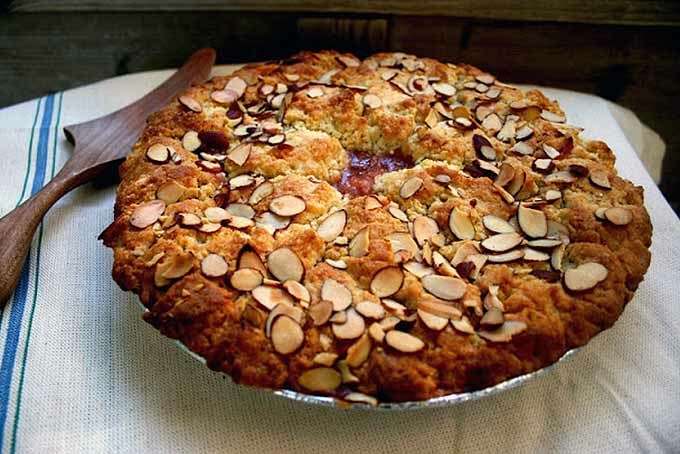 The somewhat savory cornmeal biscuit topping in this recipe from Emily Hilliard combines the best of the pie and cobbler worlds, with a sprinkling of crunchy sliced almonds on top for a bit of contrast. 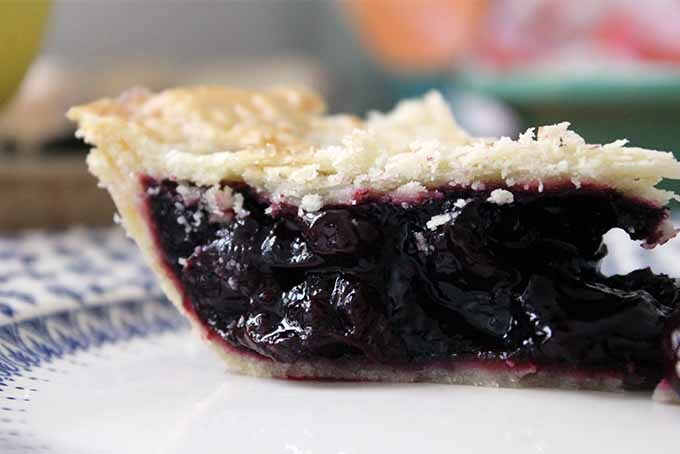 Oh, and if you’re wondering when I’m going to reveal the identity of the mystery berries in this pie… I’m not. Because there aren’t any. That pink filling is actually the quince, which turns a pretty shade of pink when cooked. Emily shares the recipe on Nothing in the House. This is another favorite from Kendall Vanderslice that offers a unique twist on a classic. White balsamic vinegar stands in for the usual lemon juice, adding a unique depth of flavor. Cooking the filling with arrowroot starch also helps to thicken it up, so you can get the perfect slice every time. 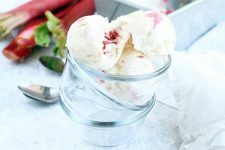 If berries are your thing, you’ll love Lauren Allen’s version, made with three different varieties. 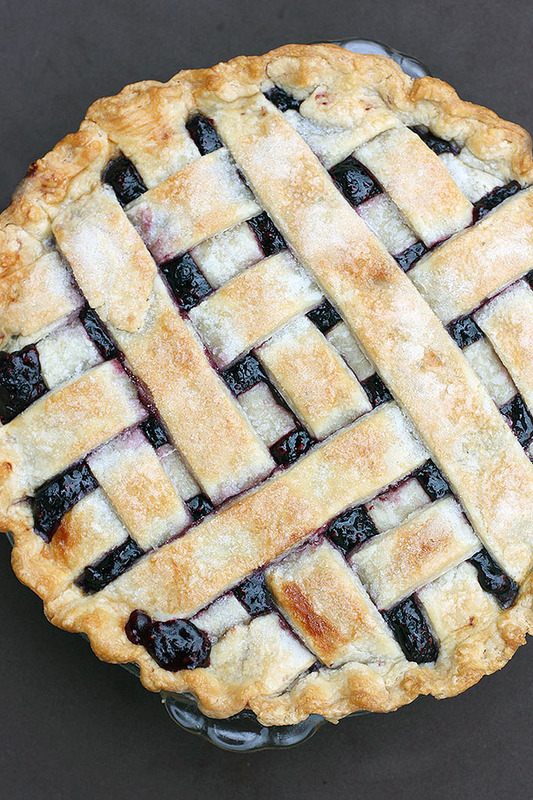 The flaky, lattice-top crust is filled with a combination of raspberries, blueberries, and blackberries. And best of all, you can even use frozen fruit to make this jammy, sweet and tart filling. It’s as simple as grabbing a few bags from the freezer section of the grocery store (or raiding your smoothie stash for a last-minute dessert)! To try this recipe at home, head over to Tastes Better from Scratch. 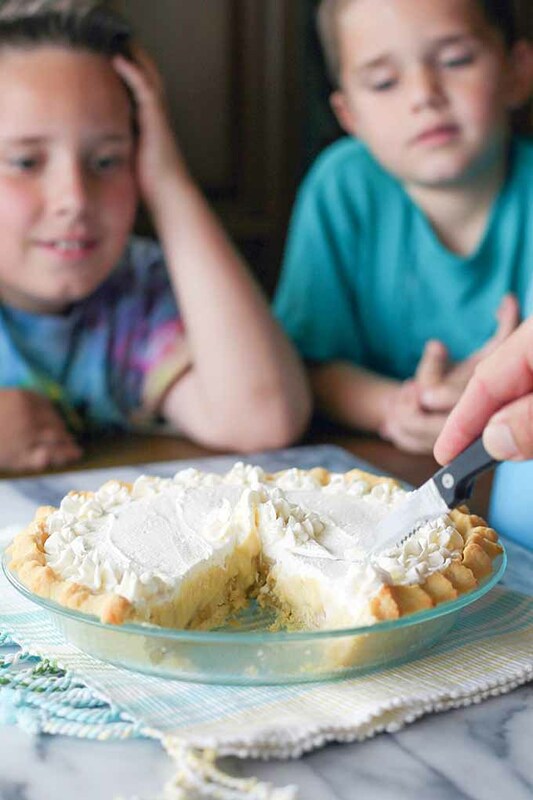 This buttery, custard-filled pie from Amy Flanigan has a crisp, sweet crust on top. And it comes together so quickly. 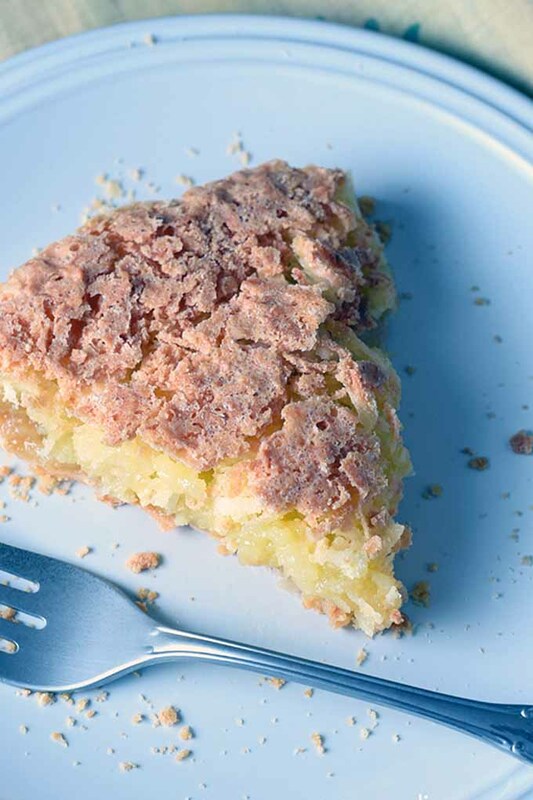 For the coconut lovers out there, this pie is truly a must-bake. With just seven ingredients, there’s nothing complicated about preparing the filling. 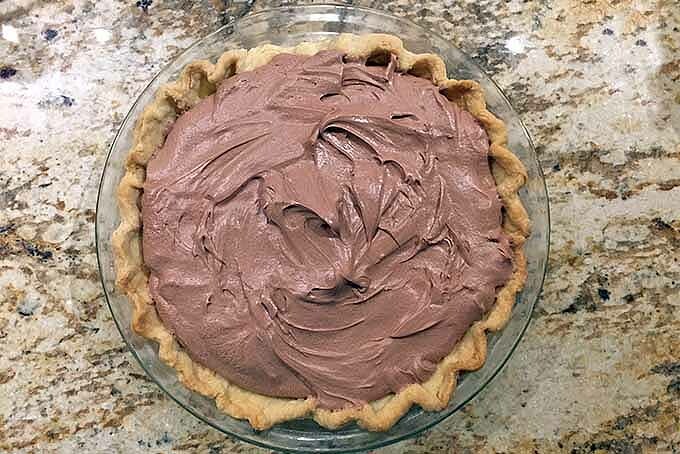 Just mix everything together in one bowl, pour it into a pre-made pie shell, and dessert is set! You’ll find the recipe on Belly Full. Nope, this one didn’t sneak in here by accident. Another combination of two favorites, this recipe takes the gooey goodness of chocolate chip cookies and puts them in a pie. With a filling that’s more custard than dough (that crisps up so nicely on top) and a mixture of white and chocolate chips, it’s excellent served warm with a scoop of homemade vanilla ice cream. 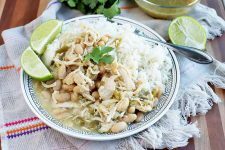 Dana DeVolk shares the recipe on This Silly Girl’s Kitchen. 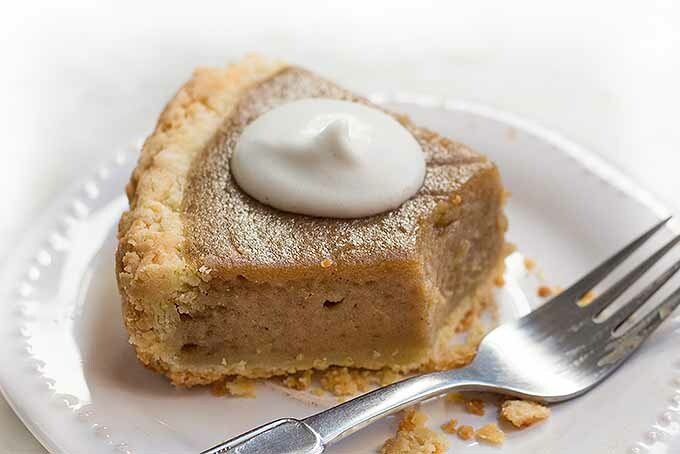 A chess pie is another favorite in the American south, and the filling is made with a combination of eggs, butter, and sugar. Sometimes you’ll find add-ins like chocolate or nuts. No one knows for certain what the meaning of “chess” in the name truly is, but we do know that it has nothing to do with the classic board game. 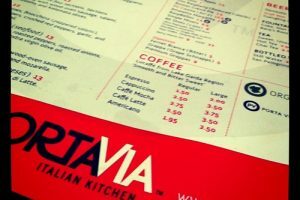 Some suspect it’s an Americanization of the British pronunciation of cheese, basically a sort of cheese-less cheesecake. My favorite explanation, and the one that seems the most plausible in my opinion, leans more on southern-accented colloquism – replace that c in “chess” with more of a hard “j,” and it’s just pie. Plain and simple. This version from Jocelyn Delk Adams is perhaps the purest form, without any add-ins needed. A sweet brown sugar filling is made with a touch of cornmeal and white vinegar, and a splash of vanilla. The sugar caramelizes to form a tantalizingly crisp candy crust on top. To make your own, visit Grandbaby Cakes for the recipe. 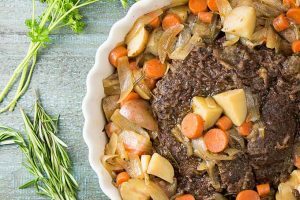 Another family favorite, another pie with “French” in its name – but this one is different from the others shared on this list. Filled with silky-smooth homemade chocolate mousse and topped with a cloud of whipped cream, rich chocolate dessert lovers will rejoice. 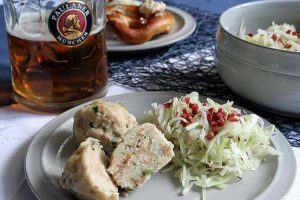 This recipe from Anita Crofts belonged to her grandmother, who comes from a family where, as she reports, everyone often raced through dinner because they knew pie was waiting – and it was that good! 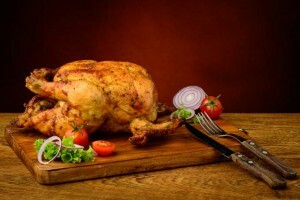 To share this deliciousness with your own family, get the recipe now on Foodal. Admittedly, this one can be a bit polarizing. It seems like you either love it or you hate it, but true advocates will fight for it vociferously, and seek it out at every opportunity. And this version of banana cream from Christy Denney is excellent. After filling your pie shell with sliced bananas, the custard filling is easy to prepare, and it’s topped with a scrumptious vanilla whipped cream. Serve it straight out of the fridge, and your guests who love banana flavor will be in heaven. Or, make one just for yourself after the holiday visitors have cleared out, and enjoy it on your own, slice by slice. We won’t tell! Visit The Girl Who Ate Everything for the recipe. Well, that about wraps up our pie round-up. Enough options for you? This year I’ve resigned myself to baking just one pie… for Thanksgiving. And then as many as I can between the end of November and January 1st! What will you be baking for the holidays? Let us know in the comments! White balsamic cherry, pumpkin sage, and apple pear photos by Kendall Vanderslice; golden sweet potato photo by Felicia Lim, © Ask the Experts, LLC. ALL RIGHTS RESERVED. See our TOS for more details. All other photography in this article is owned and copyrighted by their respective owners as identified. Used with permission by Ask the Experts, LLC. All rights reserved by all parties. 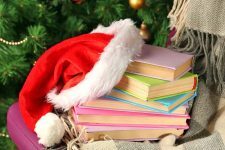 Additional link contributions by Nan Schiller, Lori Hendrix, and Janice Alian.